Structures deep within the brain control emotions and memories. Known as the limbic system, these structures come in pairs. Each part of this system is duplicated in the opposite half of the brain. The thalamus acts as a gatekeeper for messages passed between the spinal cord and the cerebral hemispheres. 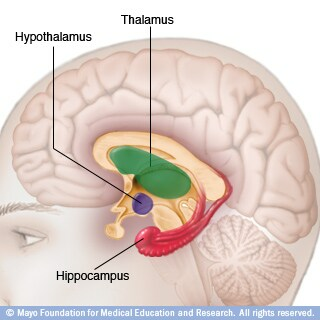 The hypothalamus controls emotions. It also regulates your body's temperature and controls crucial urges — such as eating or sleeping. The hippocampus sends memories to be stored in appropriate sections of the cerebrum and then recalls them when necessary.